Written by: Libor ŠevčíkThis “locally-cultivated” varietal is good for relaxed enjoyment, and it is especially popular with young people, who aren’t as interested in heavy vintage wines. All wine-producing countries and individual regions have varietal grapevines that do better in their local climate and soil conditions than elsewhere. In southern Moravia, as well as in neighboring Austria, this is true of the white varietal, Veltlínské zelené (in German, Grüner Veltliner). Nowhere else does this varietal grow so well as here. It isn’t as much about climatic conditions as it is about soil composition. The precise origin of Veltlínské zelené is unknown, but it probably came from Austria, where it accounts for the largest area of vineyards – 37%. 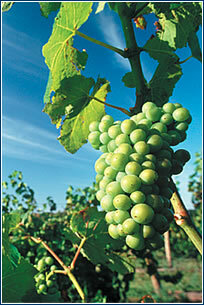 In Moravia, this varietal covers 18% of total vined lands. It is grown most in the Znojmo, Velké Pavlovice, and Podluží regions, but is also cultivated in Slovakia, Hungary, Slovenia, and northern Croatia. Veltlínské zelené is a fresh, very drinkable wine that is marked by a linden blossom nose. Although extraordinary vintages of Veltlínské zelené can be set aside, most of it is consumed while young. It is best suited for appetizers, pasta, and white meats. Professor of cardiology Milan Šamánek of the Motol Hospital conducted an experiment with a group of men who were given Veltlínské zelené, along with their regular diet for a period of time. The results clearly confirmed the positive effect of moderate wine consumption on their health. According to Šamánek, two people sharing no more than a 700 ml bottle of wine daily is good for their health. His experiment and subsequent laboratory analyses proved that Veltlínské zelené contains as many or more beneficial substances than do red wines. It is precisely to these substances that the so-called French Paradox is ascribed: although the French certainly aren’t stingy with food and don’t exercise much, they suffer from far fewer heart attacks than do people in other countries. Doctors have discovered that this is due to their affinity for drinking wine, which contains flavonoids such as transresveratrol, which help the body break down harmful cholesterol and acts as an antioxidant. So, to your health! 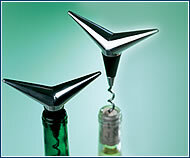 These aluminium corkscrews – somewhat reminiscent of butterflies – also serve as bottle stoppers. From the Danish producer Tommy Larsen. Price: CZK 1,556. Cellarius – Lucerna, Štěpánská 61, Praha 1. 13. 2. -Portugese wines, 20. 2. – wines from Moravíno Valtice. / Both 3-5 pm, free entry. 10% discount on tasted wines. Three of the four samples of the Veltlínské zelené varietal presented here come from the Znojmo wine area, which was seemingly created for Valtellinas. The fourth is Austrian, from an area that abuts the Znojmo region. Veltlínské zelené 2001, odrůdové bílé víno jakostní, suché, Znovín Znojmo, vinařská obec Havraníky, viniční trať Skalky. Full-bodied, pleasantly drinkable, with a peppery almond bouquet. Veltlínské zelené 2000, víno s přívlastkem pozdní sběr, suché. Ampelos, šlechtitelská stanice vinařská Znojmo, vinařská obec Vrbovec, viniční trať Nad Sklepy. A great example of varietal wine from fully ripened, healthy grapes with high natural sugar content. A striking wine with a fine almond bouquet that incorporates floral notes. A typical Austrian Valtellina that stands out with its controlled fermentation method. Good for normal consumption. It goes with vegetable salads or Wienerschnitzel. Dan Ermite, Veltlínské zelené 1999, známkové révové víno jakostní suché, Znovín Znojmo, vinařská obec Horní Dunajovice, vinice Stará Hora. A distinctively aromatic, smooth wine with a hibiscus-honey bouquet. It is set apart by its laboratory-confirmed heightened content of transresveratrol, which is ascribed in other countries only to red wines.